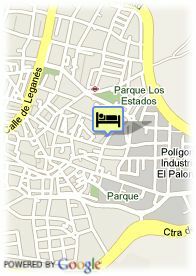 Valparaiso 12, 28944 Fuenlabrada, Spanje. 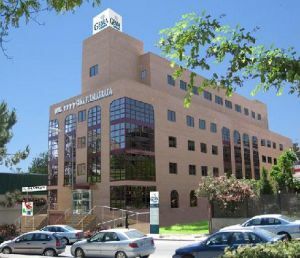 Hotel Gema Fuenlabrada is a modern and comfortable hotel in Madrid. Gema Fuenlabrada Hotel is an excellent option if you want to enjoy the stay in a quiet and comfortable place, both for spending your holidays and for the business trips. It is located very close to Madrid and surrounded by a vast transportation network, this modern establishment built in a contemporary style offers 110 large rooms. All of them are carefully decorated and equipped with TV with satellite dish, complete Bathroom and heating, among other elements. For the business client, the hotel puts to its disposal a complete Business Centre as well as five complete sitting rooms. It is ideal for any kind of events, reunions and congresses, these rooms are equipped with slide projectors, screen and the possibility to send out and to receive videoconferences, and for the leisure moments, nothing could be better than enjoying its complete gymnasium or the delights from its restaurant Trattoria Il Caldolino, specialized in Mediterranean cuisine and everything at just few minutes from Madrid. Betalende overdekte parking aan het hotel (5.35 €), Busparking.